The versatility and efficiency of pad printing equipment has expanded, thanks to the employment of stepper-motor technology. Technology tends to advance in fits and starts, and pad printing equipment is no exception. New machinery is developed by manufacturers either as a means to overcome specific technical hurdles or in response to competitive pressures. In this article, we’ll look at how the old technology of pad printing has learned new tricks when confronted with both of these issues, and we’ll explore how improved equipment designs are opening doors for the pad printing process in industrial-imaging applications. In particular, we’ll consider large-format applications involving consumer appliances, where new pad printing machines are making the technology viable as an alternative to other decorating methods. To understand how pad printing presses have evolved for these applications, it’s best to start by examining trends in consumer product design, particularly in Europe where the vast majority of pad printing equipment also is manufactured. One of the most influential trends has been the dramatic change in the design of control panels used on new European appliances, such as washing machines, dryers, stoves, dishwashers, etc. In the past, appliance panels were typically flat, but in recent years, designers have gone to great lengths to incorporate more attractive curved surfaces into their panels with the aim of differentiating their products from those of competitors. To make matters more interesting, new panels often feature an assortment of multicolor graphics across their surfaces, and the panels may be as wide as the app­liances on which they are mounted. This design trend is only beginning to edge into the US marketplace, but the pad printing equipment developed to address it has implications beyond just the home appliance market. Large-format, multi-color pad printing capabilities hold promise for a broad range of applications that have yet to be explored. When curved and contoured panels emerged in Europe, the only available options for decorating them were to use in-mold decorating technology or turn to conventional pad printing equipment. Neither option was ideal, especially considering that the same panel might be used on products sold in a dozen different countries with a dozen different language requirements. For the decorator, this meant the order wasn’t really a single project, but a collection of short-run jobs. Adding to the difficulty was the fact that many appliance OEMs demand just-in-time manufacturing on their orders. Under these circumstances, the makeready required for in-mold decorating and the frequent press changeovers necessary with conventional pad printing equipment simply weren’t practical. With the latest generation of pad printing machinery, it no longer is necessary to perform multiple setups, use multiple machines or rely on inaccurate conveyors to move large-format parts through a multi-color pad printing line. Today, pad presses are available that can print the entire length of large panels with as many as ten colors and deliver more than 60 impress­ions/cycle to achieve production rates of several hundred parts per hour. The secret behind this new level of performance is found in the stepper motor and the digital systems that drive it. Stepper motors have revolutionized the pad printing industry in Europe. In basic terms, a stepper motor is a digitally controlled electric motor that doesn’t rotate continuously, but instead moves in small increments or steps of a predetermined distance (measured in degrees). Stepper motors are controlled by computer programs or similar digital control systems that tell the motor how many steps to move and in which direction. Using this strategy, the motor can be used to repeatedly and precisely control the motion and position of any mechanical apparatus to which it is attached. A stepper motor can be programmed to travel specific distances at specific speeds. When applied to pad printing, stepper-motor technology allows the machines to precisely control the position (linear or rotational) and motion (speed, direction, etc.) of parts along multiple independent axes, as shown in Figure 1. In this example, the operator loads from the far left side of the linear indexer, so the part travels right/left along the Y axis via a linear indexer and in the R axis (rotation) via a rotary table, while the pads travel in/out along the X axis, and up/down along the Z axis. This programmability means better process control, even for someone producing a simple single-color application in which parts are manually loaded and unloaded from the press. In multi-color industrial applications, pad presses driven by stepper motors can provide a faster and less expensive alternative to in-mold decorating or direct screen printing. In the past, stepper motors pad presses were either driven with simple pneumatic cylinders or electromechanical devices that could only travel a non-adjustable distance. Sure, a press might employ a mechanical stop or a limit switch, but we couldn’t move that stop or switch during a print run to vary the distance the machine moved in any particular direction. With a stepper motor, however, we can select the exact distances we need the print head and part to travel in each axis and vary these distances over the course of the print run if necessary. Stepper motors that drive the pad assembly can be programmed so that each pad picks up images from different locations of the clichés at each stage of the print cycle. By “stacking” images on the clichés from front to back, we could repeat the cycle described for Figure 1 using secondary image-pickup locations. Depending on the size of the clichés used, this approach could work with even a greater number of images per cliché, allowing dozens of images to be printed during the same cycle. The machine in the example has +/- 80mm of adjustment in the X (in and out) axis over the part being printed. In instances where that might not be enough, a second indexer could replace the rotary table in the previous example to accommodate linear motion in both the X and Y axes, as shown in blue outline in Figure 2. 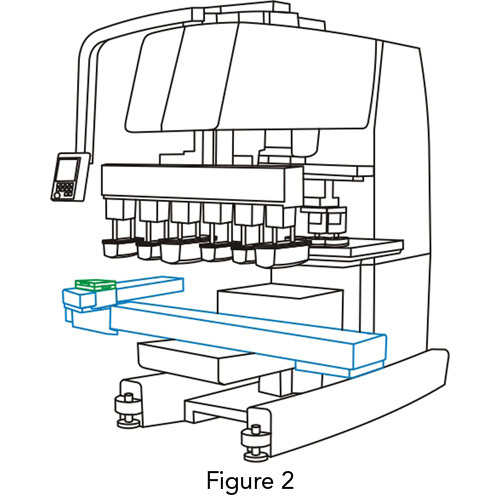 For fine angular adjustment on top of the indexers, a sine plate could be installed, or a small X-Y-R axis cross table could be used, as shown in green outline in Figure 2. If working with more difficult three-dimensional parts, other handling systems also can be employed. 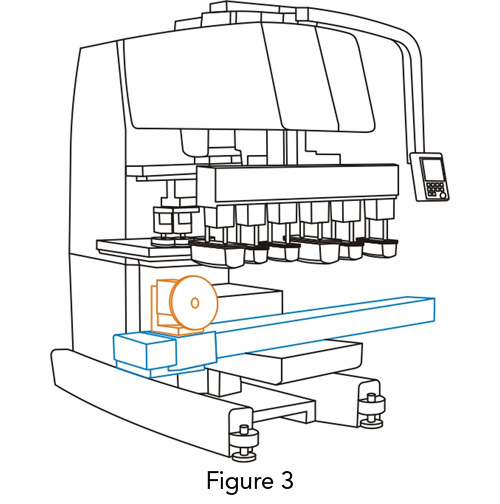 For example, Figure 3 depicts how a small rotary dial (also stepper-motor driven, illustrated with an orange outline) can be mounted vertically to a linear indexer (illustrated in blue). The part easily can be rotated to allow placement of multiple images around its entire circumference. 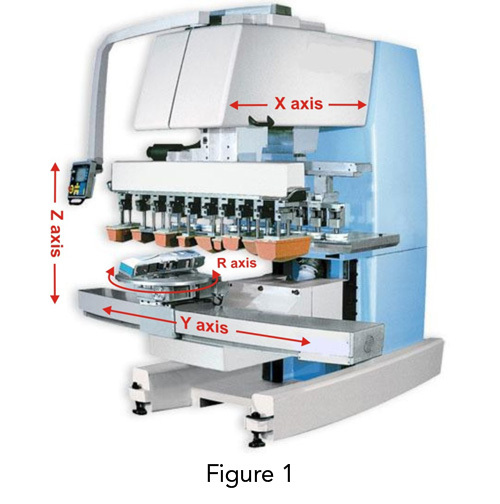 It is not uncommon for owners of stepper-motor-driven pad presses to have several different part-conveying accessories on the shelf to accommodate a range of different applications and movement schemes. With today’s user-friendly digital operator interfaces, reprogramming the press for these accessories is simple and straightforward, allowing the machines to be easily reconfigured. Some European printing operations have developed routines that allow them to print as many as ten colors along six axes of motion, with over 60 impressions/cycle. Besides supporting a broad range of part-conveyance access­ories and motion sequences, pad presses driven with stepper motors also allow users to employ combinations of different sizes of sealed ink cups, and clichés of varying dimensions within the same set-up. In some cases, cliché doctoring systems can be employed to accommodate the doctoring of clichés in/out in the X axis, and others right/left in the Y axis, enabling the user to print long narrow images in conjunction with several smaller, multiple-colored images all in a single cycle. What about registration? Most stepper-motor pad printing machines come with prepress equipment specifically designed to “preregister” films to clichés before they are exposed with the image. Typically, polymer clichés are used that are pre-punched with holes that correspond to pin-registration systems. The films then are aligned and punched with registration holes so that they align precisely where they’re needed on the clichés. To reduce changeover times, some presses allow the entire cliché platform assembly (clichés and ink cups) to be completely removed as a single unit from the machine for cleaning or replacement. By having spare cliché platforms and accessories available, changeover can take as little as 10 minutes for applications that involve as many as 10 separate printing operations or colors. Dozens of other applications also are good targets for the technology of stepper-driven pad presses. Bezels, for example, can benefit from these machines and their ability to support larger part sizes than conventional pad printing presses. Just consider the variety of products that may require graphics on their bezels, such as computer monitors, home video products and other electronic devices. Medical device control panels are another large, but untapped, market that has potential for shops using multi-axis pad printing equipment. The list goes on with everything from automobile dashboard components to toys. Labor reduction is a key justification for adopting stepper-driven pad presses. These labor savings are realized primarily by interfacing the machines with other elements of an automated production line. Because they are stepper-motor driven, the pad presses easily can be connected with the programmable logic controllers and computers that drive other systems, creating an integrated manufacturing system that be controlled through one operator interface. Stepper-motor technology also allows machines and part-conveying accessories to be easily integrated with non-print-related automation. Picture a part-handling robot and a stepper pad printing system configured with a plastics molding machine. When the mold opens, the robot rapidly removes two bezels that were just formed, placing the parts, one at a time, on a rotary table. The table indexes to print the first bezel, then again to print the second. While the second is being printed, the first is being dried with a hot-air dryer that also is integrated with the system. As the parts leave the dryer, the robot picks them up and deposits them in a package, which is sealed and whisked off by a conveyor to the shipping department. By eliminating several material-handling steps, these machines working together can mold, convey, print, dry and pack more bezels than a team of human workers using conventional production methods. Orchestrated by the programmable logic system, the motions of a stepper-motor press are fantastic to see, and the speed at which complex printing jobs can be processed becomes instantly apparent. My first exposure to this technology occurred at a trade show in Milan, Italy in 2000, where we watched in fascination as a stepper-driven pad press printed toy train cars on five sides using a combination of open inkwells and sealed ink cups. The experience was like being a UFO geek with a day pass to Area 51. The transition of pad printing from a labor-intensive specialty printing process to an automated industrial decoration method has been made possible by advances in many areas, from computer-based filmmaking and photopolymer or laser engraved clichés to self regulating inking systems and digital controls. The introduction of pad presses driven by stepper motors adds even more capability to a process already sought out for its versatility. With this technology, industrial printers can provide an efficient and accurate decorating method that supports both high-volume, high-speed production and short-run, just-in-time applications. John Kaverman has a degree in printing technology and decades of experience in process, applications and pad printing systems engineering. He has written extensively for Plastics Decorating and other industry-related publications and organizations, and has authored two books on the pad printing process. Kaverman is the head of Pad Print Pros and can be reached at 517.467.5340 or www.padprintpros.com.